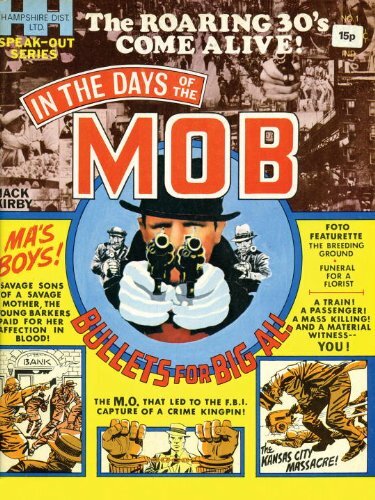 ANDY’S PICK :: IN THE DAYS OF THE MOB HC: Jack Kirby was always breaking new ground. When he left Marvel in 1970 over creative and financial differences, he landed at DC comics where he created the justly famous Fourth World series. But he didn’t stop there. He created a line of black and white magazines that were just a few years before their time. DC collected one of those magazines, Spirit World last year and now they proudly re-present, In the Days of the Mob. Kirby was once again way ahead of the curve as gangster stories would take over Hollywood about a year later. These stories represent Kirby at one of his many creative heights. You don’t want to miss this. Collects IN THE DAYS OF THE MOB #1 and stories from AMAZING WORLD OF DC COMICS #1 and 10.